"HUSKERS SQUEEZE THE WEASELS, 32-28"
The following is a transcript of a recent broadcast of "The Husker Bashers Association Helpline" seen and heard weekly on cable access channel 1802. Let's listen in. Good evening, this is your host, Wendel Cashmere, host of the HBA Helpline, where each night we help cure people of Husker Fever. We help set the record straight about all the phony euphoria over Husker football. Give us a call at 1-800-BASHTHEHUSKERS where our motto is "Lose The Faith!". Agree or disagree, give us a call. WC: Okay, let's go to our first caller, Marty from Omaha. Welcome to the HBA Helpline. Caller: Hmm, I'm a nittle lervous-I mean, I'm a little nervous. WC: No problame-oh, pal. You're doing fine. C: I just wanted to say, I've been a Peterson/Callahan/West Coast Offense basher ever since that stinkin' bunch arrived in Lincoln two years ago. All my co-workers know I'm a Husker Basher, but ever since the Huskers beat Michigan last week, I'm really taking a lot of heat. All I hear is that because of their 8-4 record, the Huskers are back on track. How can I set these people straight? I'll hang up and listen for your response. WC: Good call. The 'Restore The Order' BS is a joke. For the record: the Huskers beat a Michigan team that ended the season at 7-5 which is the worst Michigan team since 1984! Hello!! This year, because of injuries and the fact that Michigan really didn't want to be in the Alamo Bowl, the Wolverines were definitely not up for the game. So the Huskers lucked out, big time. WC: Let's go to our next caller, Brian from Lincoln. Welcome to the HBA Helpline. C: Hmm, you know, I'm an H-Basher, too, but the 8-4 record is pretty good, considering that last year the Huskers had a 5-6 record and didn't even go to a bowl game. WC: Eight and four, schmate and four! With their pathetic schedule that included teams like 1-AA Maine and the Sisters of the Poor, what team wouldn't have winning record! C: But they did play 7 teams that qualified for bowl games. WC: Right. Like Kansas and Iowa State and Colorado. Give me a break. C: But Nebraska beat Michigan by the same number of points as Ohio State did, and Ohio State really ripped Notre Dame this week. WC: Big deal. That was then, this is now. Let's go to our next caller, Damon from Council-tucky, Iowa. C: Look, I'm no big Husker fan, but if you look at the record, the Huskers beat the Big 12 North champion; came within a one play of beating Texas Tech and came within one overthrown pass of taking the Sooners into overtime. So the Huskers could have easily ended the season at 10-2. WC: Right, but let's talk about Pittsburgh at home. If the Pathetic Panthers had a center who could snap the ball, the Huskers would have lost that game. And speaking of lame games, the K-State game was about as ugly as it gets. And a double OT win at home against Iowa State-big deal. If Nick Leaders had hands, the Huskers would have lost that game, too. So anyone who wants to get all excited over a team that very easily could have been 4-7 in the regular season and would have never been bowl eligible, is in need of some serious help. Forget it! Let's go to Mike in Blair, Nebraska. You're on the HBA Helpline. C: Look, I'm an HBA member, too, but I'm also getting a lot of flack from Husker fans who say the fact is, Nebraska didn't lose those games. They say, if you want to discount the ugly wins over Iowa State, Kansas State and Pittsburgh, then don't you have to recognize the near wins over teams like Texas Tech and Oklahoma? I mean, what's fair is fair, right? SC: Fair, schmair. Get real. Like we say, 'Lose The Faith, baby'. The next thing these dippy Husker fans will be saying is that this Husker team could play with Southern Cal. Come on! Get real! Let's go to Debbie in Lincoln. C: Thanks for taking my call. I've been listening to all this talk about how bad the Huskers are, but shouldn't we be dealing with reality? C: I mean the what-ifs, maybes and might-have-beens don't count-they never have and never will mean anything. Anybody who follows sports knows that. Every Husker fan knows that Nebraska should have beat Florida State in the '94 Orange Bowl and would have been the first and only team to win 3 consecutive national championships. But it didn't happen. Corey Dixon's punt return was called back due to a phantom clip. And in 1982, the Huskers should have beat Penn State, but had two horrendous calls go against them in the final moments of that game. That's the only loss the Huskers had that year. There's another national championship that didn't happen for the Huskers. Those what-ifs didn't count then, so why not give the Huskers their due this year? I mean the fact is, the Huskers won 8 games, including a win in the Alamo Bowl over a Michigan team that began the season ranked in the top five in the country. Michigan went on to hand Penn State its only loss of the year-and Penn State will likely end up ranked in the top five in the country when the final polls are taken this week. C: Let me finish. Yes, the Wolverines did lose 4 games, but that was by a total of 17 points! Seventeen points! And Michigan lost to Ohio State by four points which is the same number of points by which they lost to the Huskers. And look what the Buckeyes did to a pretty darn good Notre Dame team. Ohio State embarrassed the Irish! C: Let me finish, please. Consider this: Ohio State will likely be ranked number 1 or 2 in the preseason polls next year. Keep in mind, the Huskers scored more points on the Wolverines than Ohio State did. Ohio State's quarterback, Troy Smith, a guy who will likely head the list of pre-season Heisman candidates, threw for one TD against Michigan, while under-rated and unheralded Zac Taylor threw for 3, count 'em 3 touchdowns against the Wolverines. The Huskers scored more points in the first half , second half and the fourth quarter against Michigan than did the vaunted Ohio State Buckeyes. The Huskers were out-manned, but not outplayed by the Wolverines. And Bill Callahan and his staff called a brilliant game and most certainly out-coached Lloyd Carr and his staff. I know earlier in the year, the Huskers weren't a very good football team. Even against K-State, they looked bad. But the fact is, they won their last 3 games of the year for the first time since the 1999 season. And while no one in his right mind would put the Huskers in the same league with Southern Cal or the Longhorns this year, the Huskers made significant improvement-especially in the last couple of games. There was so much improvement that the Huskers have a good chance of ending this season ranked in the Top 25. And before you want to denigrate the win over Colorado, the Huskers beat the Buffaloes worse than the Longhorns did in the regular season! And Texas is playing for the national championship. The Husker coaches should be given a great deal of respect for molding a team that had enough resolve to overcome injuries, bad plays, inexperience and lack of depth to wind up 8-4. I'll hang up and listen to your comments. 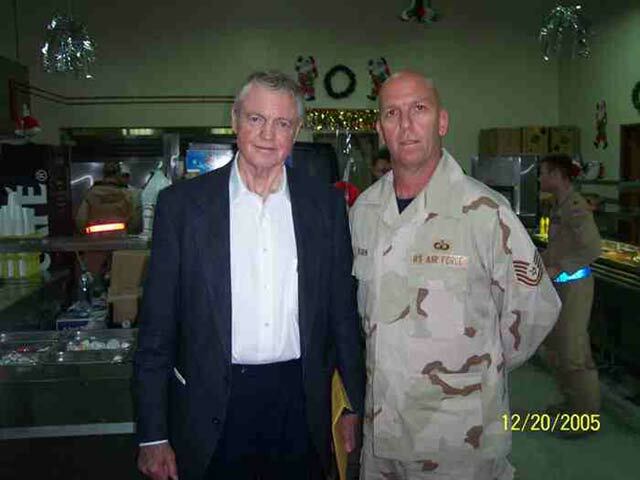 Husker Dan: This is a picture of Tom Osborne and me when he was in Kuwait recently. This made my tour for sure! Dear Alan: First of all, thanks for your service to your country and thanks for sharing your picture with us! Enclosed is a picture of our grandson Seamus who lives in Kansas City. 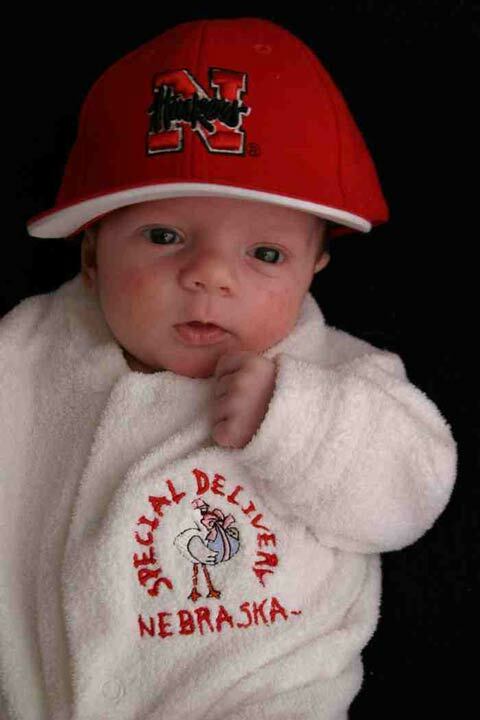 We're getting an early start with being a Husker fan! 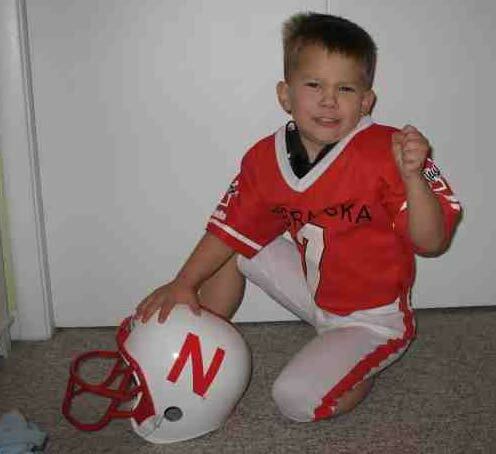 We wanted to show you our son Isaac wearing his Husker football uniform. He loves Nebraska! 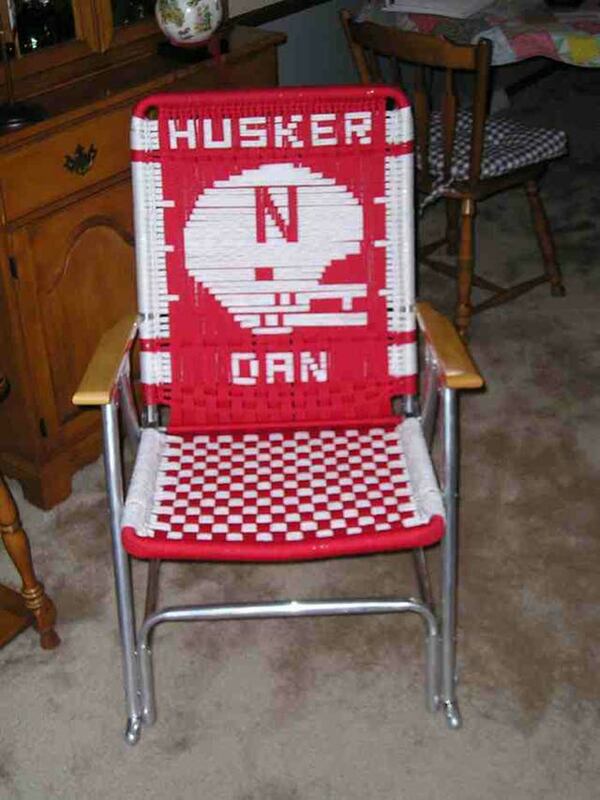 A special thanks go to Mike and Susie of Sioux City, Iowa for sending me my Husker Dan chair! It is a blast!! If you'd like to give Husker Dan a piece of your mind or want to invite him to speak at your next Husker event, you may email him at here. For past Husker Dan columns click here.